We’ve said it before, and we’ll say it again: when you’re on the water, wear your life jacket – also known as a Personal Flotation Device (PFD). Year after year, dozens of people lose their lives while boating. And year after year, statistics show that many of these tragedies could have been prevented by wearing a well-fitted, properly-adjusted life jacket. Having a life jacket is not enough. Wearing a life jacket is not enough. 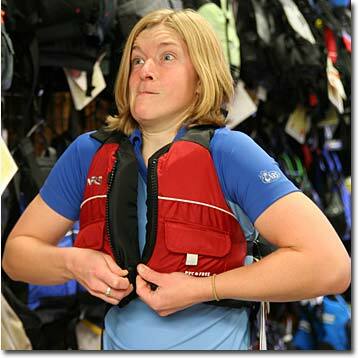 Only a good-quality PFD that is worn properly can be counted on to keep you afloat in the event of an emergency. We’ve shown you how manufacturers make sure your PFD is safe, according to standards developed by the US Coast Guard. We’ve taught you the ABCs of PFDs, explaining the different types of life jackets and the features and benefits to look for when selecting PFDs for you and your children. 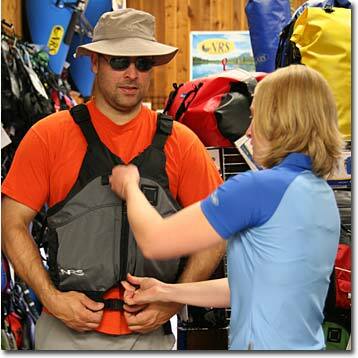 Now we’ll show you how to find the right size PFD and how to adjust it to fit comfortably and securely. Your life jacket should fit snugly without being too tight. The term the Coast Guard uses is “comfortably snug”. If you can’t make your life jacket fit snugly, then it’s too big. If you can’t comfortably put it on and fasten it, it’s too small. Here’s NRS Customer Service Representative Emily demonstrating the “Goldilocks” test. Okay, go finish your porridge, Emily. Every PFD manufacturer has its own sizing system, and it’s important to confirm sizing before purchasing any brand of life jacket. And of course, always try on a vest to be sure it fits before you hit the water. 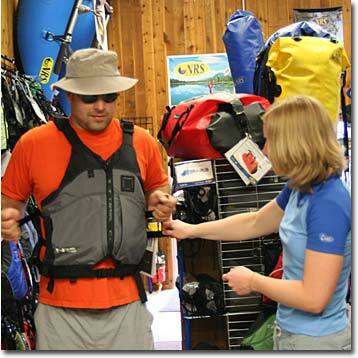 NRS life jackets come in three size categories: Child, Youth and Adult. The first step toward finding the proper fit is to determine which category the person wearing the life jacket fits into. Finding your size is simple: measure your chest with a sewing tape and compare the measurement to the PFD manufacturer’s sizing recommendations. The main difference between a small and an extra large NRS PFD is that the larger size has longer straps that allow the PFD to open wider in order to accommodate larger bodies. In other words, the extra large will fit a smaller person (albeit with excess strap length), but a small PFD won’t fit someone who needs the bigger size because there won’t be enough strap. 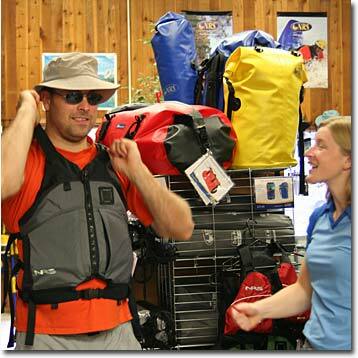 Some styles of PFDs may fit your body type and boating style better than others. 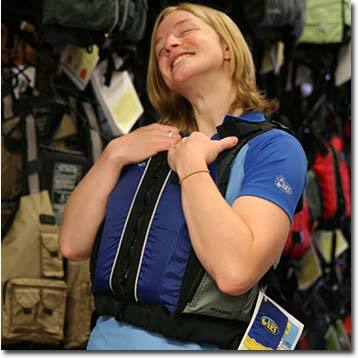 The best way to know you’re getting the right PFD is to buy it from a reputable company with a knowledgeable sales staff. At NRS, we’re always here to take your call or answer your email. 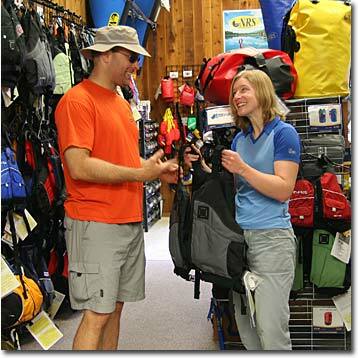 We can also recommend local dealers where you can compare PFDs, try them on and get great advice. Just having the right PFD is not enough to keep you safe. You have to wear it, and you have to wear it the right way. We’re glad “Boater Alex” stopped by NRS on his way to the river. He sure could use some help! Luckily, Emily has finished her porridge and is ready to lend a hand. Different models of PFDs have different systems for entry and adjustment, but the goal is always the same—a snug secure fit. It’s best to start with adjustment points loose, and then tighten them sequentially to ensure a good fit. Emily will demonstrate by helping our customer achieve that “comfortably snug” sensation. First things first. 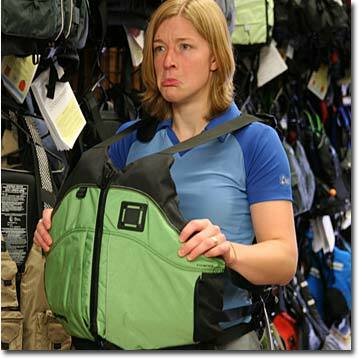 With the PFD positioned midway around the customer’s torso, she buckles the bottom buckles and zips the front-entry zipper. That bottom adjustment is critical to preventing ride up; it helps “anchor” the jacket. Now she shows Alex how to tighten the adjustment straps by pulling forward on both sides at the same time, working from the bottom to the top. Finally, she shows him how to tighten the shoulder straps to complete the custom fit. Like a glove! 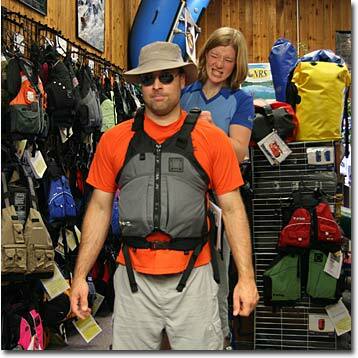 But before Emily lets this customer walk out the door, she’s going to test the fit by pulling on the PFD’s shoulder straps. If the PFD slides up around his ears, then it’s back to the drawing board. If it doesn’t budge, then we’re in business. Yep, it fits. Now Boater Alex is properly outfitted for safe boating. Let’s recap. Wearing a PFD when you’re on the water is the single best thing you can do to ensure your safety. Selecting a model that’s comfortable for all-day wear helps ensure that you’ll want to keep it on… all day. Either contact us, or your local dealer, for recommendations on the jackets that are best for your type of boating. When you can, try on different models to find one that’s comfortable for you. If you’re ordering directly from us, please give us a call (877.677.4327) and we’ll help walk you through the selection process. 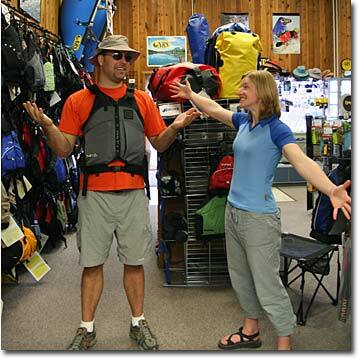 Use the chest sizing guide to pick the right size PFD. And remember, if you’ll be wearing it over cold water/weather apparel; take that extra bulk into account. Finally, adjust your PFD for that comfortably snug fit. Loosen the straps, then tighten them snugly, starting at the bottom and working up.